It's Fall at my house! So I woke up this morning and when I walked outside my front door Abilene surprised me with a dark/dreary, cool day. I LOVE IT! To me it is the first sign of Fall, and then with that was a dark sky that was full of color which is also a wonderful treat to start the day off with. So anyways, since I'm feeling Fallish today I decided to start a series of Fall crafting blogs....highlighting things that I have been doing around my home to make it feel like Fall! 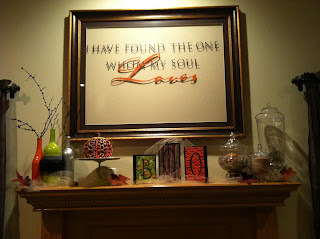 So I will start off with my mantel! 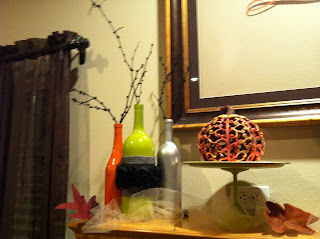 So here is a look at my mantel with our mantel spotlight shining on it. When I decorate for Halloween I enjoy fun colors and pretty things...I try to steer clear of scary decorations. So let's take a closer look at what I did. Then after they dried because of the size of the wood they easily stood straight up on their own. 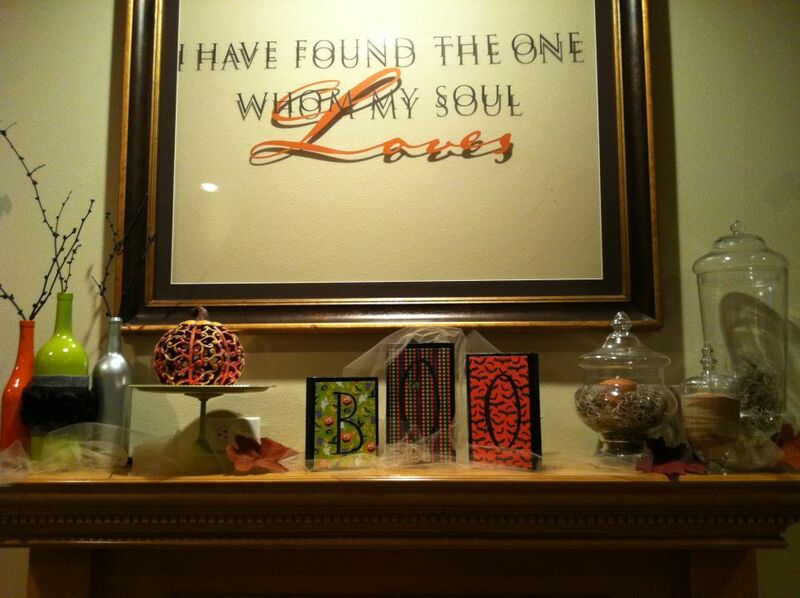 On the left side of the letters I put these fun wine bottles that I painted and sticks in them. 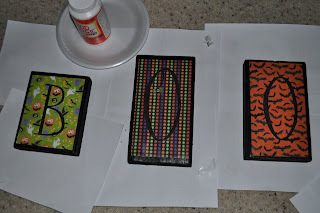 First I took wine bottles and soaked them to get the labels off, then I took them outside and spray painted them different colors that matched my fun color scheme. I wanted all different shaped bottles to add some fun contrast. Then I took some spare crafting ribbon and yarn that I had to decorate the middle bottle. That is gray yarn on the top and bottom of a black rosette covered ribbon. I then found a few sticks and spray painted those black to add a more Halloween look to it. To the right of that is a cake stand that we made for a school event. Although you can't tell in the photo, it is also spray painted a lime green. For this we bought martini glasses and silver platters from the dollar tree, meaning I spent $2 on this. 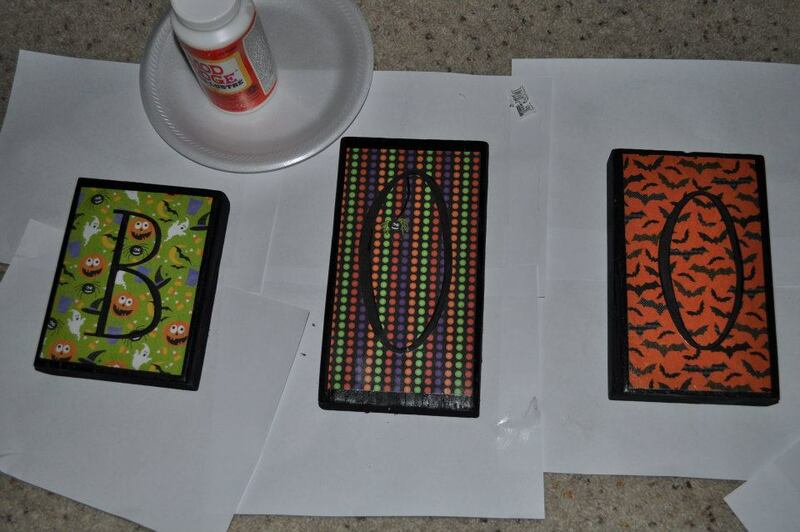 We glued them together and then spray painted the bottom different colors. It is great for holding a cute pumpkin or for holding cupcakes or something at a party. For the first one I took some gray moss that I bought from the dollar tree and filled the bottom then put an orange candle that I had inside of it. SIMPLE! Then in the last one I put a little bit of moss and then filled the rest with baby pumpkins. (This isn't shown here because I took this before getting the pumpkins. 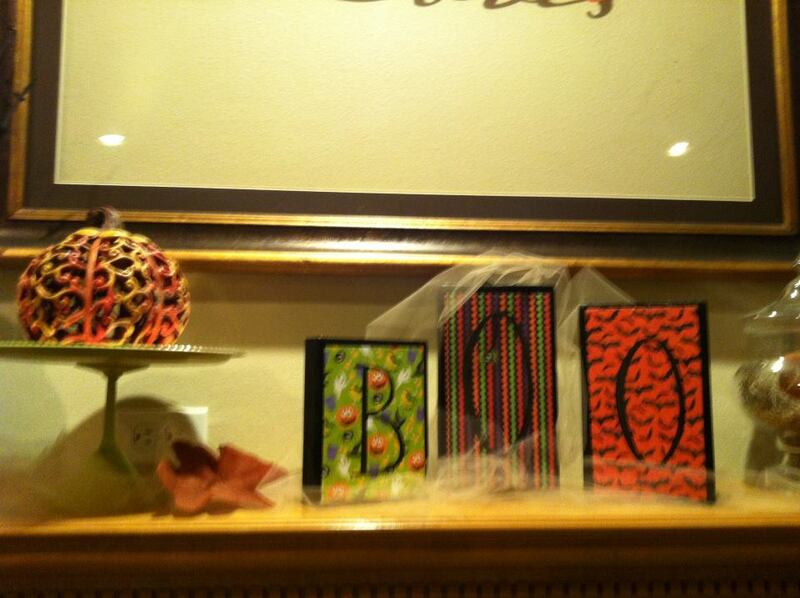 So finally this is my Halloween mantel! After I was done I realized it was missing something so I took some tan tulle, also from my wedding and wrapped it through what I had up, adding some paper leaves throughout it also. I partly wish I could do something above it but we chose to put that giant, heavy glass frame above it. Which means it would be so much work to take it down, Meguell would have to do it lol, and there would be two huge screw mounts in the wall where it hangs. So anyways, I'll keep it for now! 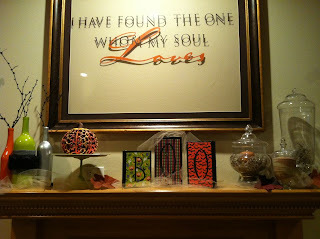 I love having a mantel and having a bigger house to decorate! Stay tuned for more Fall decor, and follow me on Pinterest where I share and get a lot of my ideas from! Older PostCrafting is consuming my life....AND I LOVE IT!